28MP BSI APS-C sensor, same as in NX! Difference with NX1 - no 4K output via HDMI. no 1080p120 mode, no mic input and headphone output, no UHS-II support, no 802.11ac. 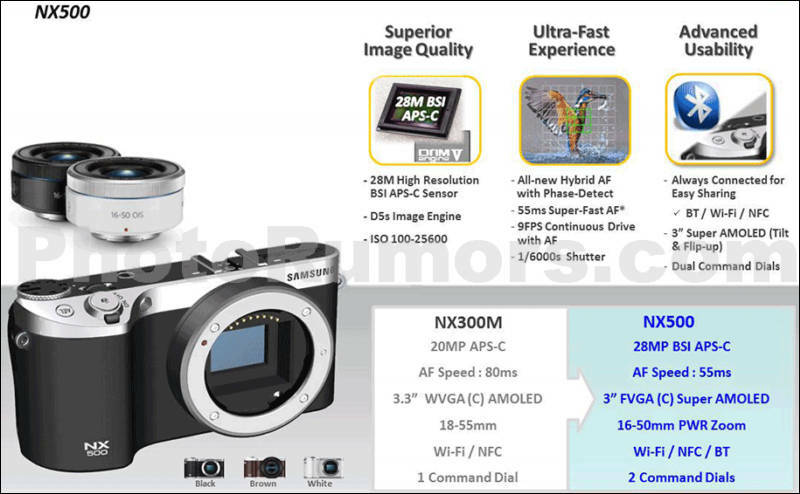 Samsung Electronics Co., Ltd, today announced the launch of its new NX500, combining industry-leading design and technology for everyday use, with the capabilities that professional photographers can rely on. Featuring advanced technology such as high resolution 28MP BSI APS-C sensors, 4K and UHD video recording, a best in class DRIMeV image processor, NX AF system III, and Samsung Auto Shot, the NX500 has the core functionality of the NX1 engineered into a portable and convenient size. Updated connectivity via Bluetooth and Wi-Fi provide users with an advanced wireless experience, as well as the ability to seamlessly shoot and share their captured experiences. “We recognize the importance of the photograph and being able to capture and share the perfect moment from wherever you are. That’s why Samsung has built a camera suitable for everyday photographers,” said Sangmoo Kim, Senior Vice President of IT & Mobile Communication at Samsung Electronics. “The compact size of the NX500 and its revolutionary shooting and focus speed allows consumers to enjoy superb image quality. We’re redefining what is possible for people who aren’t professional photographers, and offering everyone the ability to capture their signature moments in every shot." The NX500 guarantees superb image quality and vivid photographs, regardless of the shooting scenario or subject matter. With its ultra-high resolution 28MP Back Side Illumination APS-C sensor, NX500 has the ability to take the perfect shot, even in low light situations. It also supports both 4K and UHD video recording, utilizing BSI APS-C sensors, the largest BSI sensor currently available, which provides more flexibility when it comes to capturing movies. The built-in HEVC Codec, the most advanced compression technology available, brings efficiency to the storage of video clips by compressing high quality video to half the size and the bit rate of H.264 footage, without any compromise on quality. Additionally, still images captured from Interval Capture mode can easily be transformed into a UHD Time-lapse video directly on the camera, without the need to transfer images to a PC. The NX500 is equipped with a DRIMeV processor, which is much faster than its predecessor. This feature boasts superior color reproduction, improved noise reduction and enhanced image quality, providing users with results that serious photographers crave. Combined with an innovative 28MP sensor and Hybrid AF system, users can capture even the briefest of moments by simply focusing and shooting immediately, allowing for extreme speed and flexibility. Additionally, 9FPS continuous shooting means NX500 users can easily monitor and capture ongoing action shots. 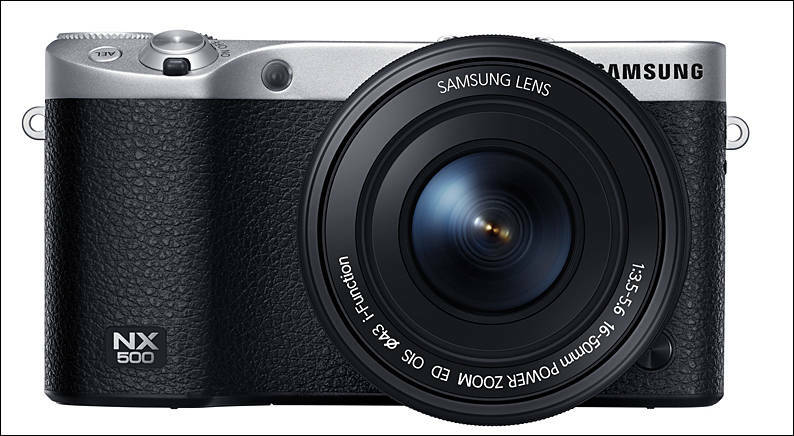 Further enhancing the NX500’s action capture capability, the Samsung Auto Shot (SAS) feature uses motion detection to accurately predict when to capture the perfect shot in difficult scenarios, such as when a child fields a baseball. 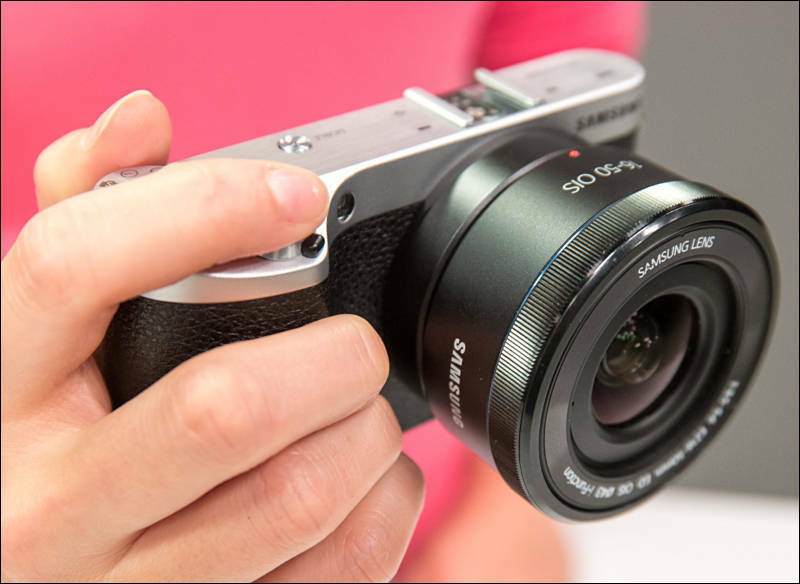 The ergonomic design of the palm-sized NX500 allows users to carry the camera with a comfortable grasp at all times. With a Tilt and Flip up function, as well as bright vision through the display, users can easily take the perfect selfie. Also, the NX500 provides seamless wireless set-up with Wi-Fi, Bluetooth and NFC. With its outstanding data transfer speed and Bluetooth functionality, users can send both large images and video files swiftly to other smartphones and tablets. This looks really promising. I might be jumping the gun but if samsung can keep up the good work the nx500 will be the second part of the dynamic duo I always wanted. The NX1 being the first, same lenses, one compact body, and one full size. New SMART option: GEO tagging, 4x faster Wifi connection, Bluetooth etc. Nice, If they have the same 120fps mode and a decent body I may get one! But will it have an EVF? What is 2.5K Quad HD? You can imagine it as having a two dimensional box (720). You want to double the height of the box, but you also want to keep the same dimensions overall (16:9). That means that if you double the height of the box you also have to double the width. So they Double 720 and get 1440. But they also double the width (1280). Technically it could be called 1440p instead. But like they did with 4k, they opted to change the units of advertised measurement for marketing purposes. 1440p becomes 2.5k QUAD HD. Yikes. That would be a step back. I'm used to calling that "2K" but I see that the phone displays call that quad--take full HD, divide by two and multiply by four. @DrDave I added a bit of an explanation to my other post. I'm hoping the current stats are an early reporting error. It would be a step back for me as well. I think that the NX500 will be a) reasonably full featured and rather expensive, or b) well priced but crippled in comparison to NX1. It may end up to be analogous to D7100 (plenty of manual controls, pro body) vs D5300 (controls rather in menus, geared for entry level enthusiasts). The IQ is pretty much the same for both the D7100 and D5300 (I know, they are a generation apart, but you get the idea :) ). So, what direction, Samsung, do you want to go? That's a great price. The 16-50 power zoom is a pretty good, sharp lens. It costs $300-350 alone (very cheap for its performance). If the reviews will be good, I will get it as a B camera for my NX1, sell the GH3 and a7/ a7R, and buy fully in the NX system. 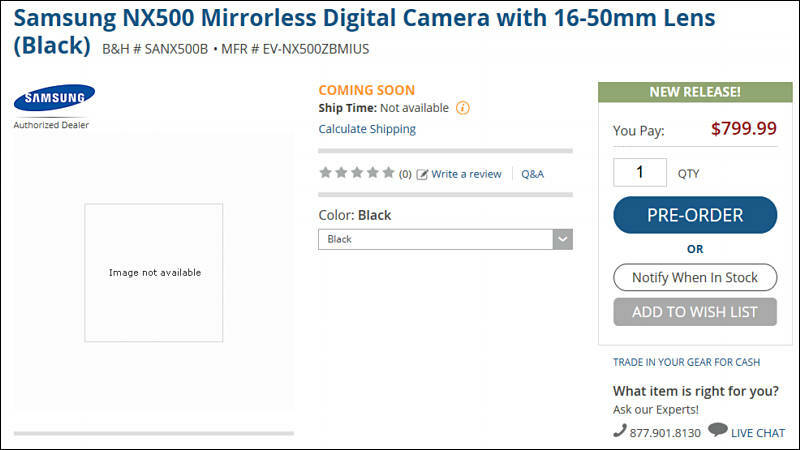 As I see it, Samsung is on the way to do with cameras what they did with TV's and smart phones/tablets. I give it less than 5 years. Good bye Canikon, whatch out Sony & Co. The time will tell but that's what my crystal ball is telling me. It is not latest rumors, it is just repeat of leaks you can see above. Samsung starts to be appealing now. How do they named their lines? Single digit for pro, double digits for enthusiast, and three digits for amateur? 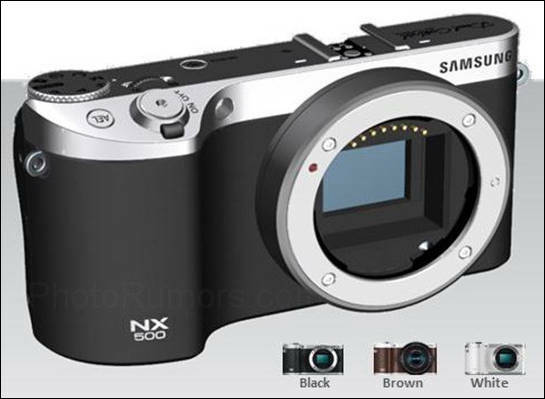 If so, then it might be a sign that there will be a successor of NX30 in a near future. "It is not latest rumors, it is just repeat of leaks you can see above." Not exactly. The spec is nothing new but the linked article is new (came up today) and has evolving info on the subject some may find interesting (I did). I thought it may be beneficial for those who follow NX500 closely. Officially announced, has UHD recording and such. Updated first post and added PR.